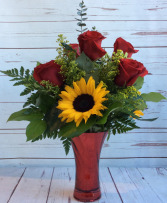 Red Roses and sunflowers arranged in a dark red, shiny vase accented with yellow solidago. 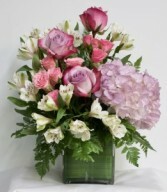 Beautiful red roses, spray roses, alstomeria and many other flowers arranged and ready to drop into your vase. Simply add the flower food to your water and trim the stems to the length you desire.